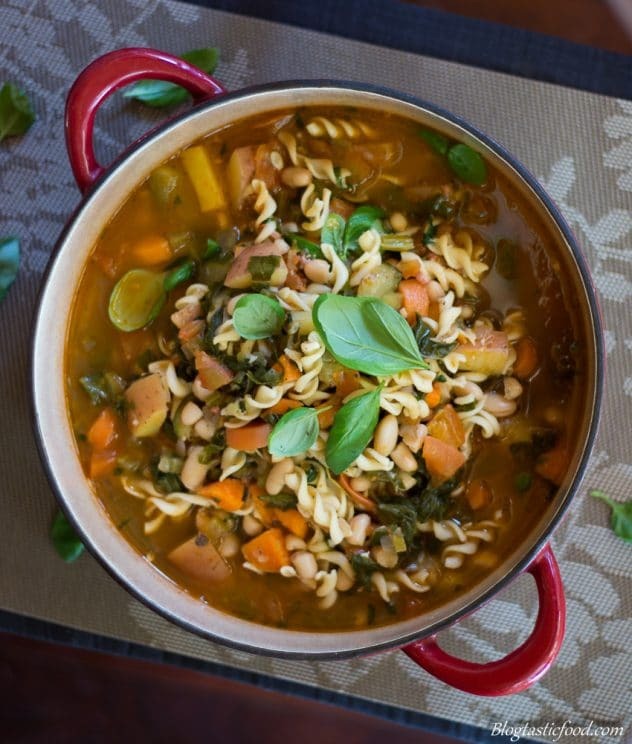 If you warm the family up with this comforting minestrone soup. They will only moan about how you didn’t make enough. 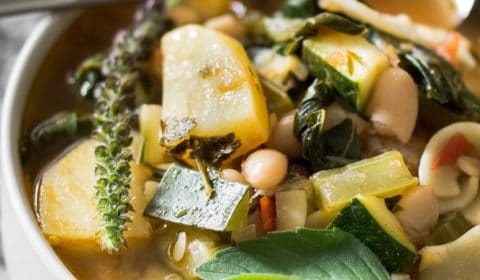 I have looked up a lot of minestrone recipes, which are all quite similar. And pretty much all of these recipes looked and sounded great but there was just 1 thing that questioned with most of them. I don’t want to claim that I am making this recipe the “right way”. However, I think that there are a few changes in the method of this recipe that could perhaps make it a bit better, and let me explain how. A lot of recipes tell you to boil the ingredients for quite a long period of time. I would see many recipes that instruct you to add all of the vegetables and cook them for about 30 minutes or until they’re cooked. Then, add your pasta and cook until al dente. There are a couple of issues I have with this. Every vegetable in that dish will cook at different times so I’m not a huge fan of just cooking them all for the same amount of time. And wouldn’t all the vegetables be completely overcooked by the time the pasta is cooked? 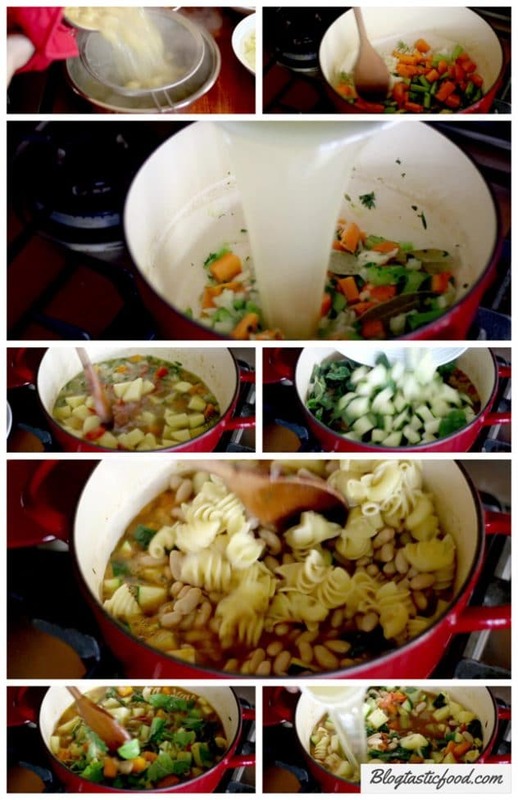 Since a lot of the recipes instruct you to cook the vegetables first THEN add the pasta and cook it. 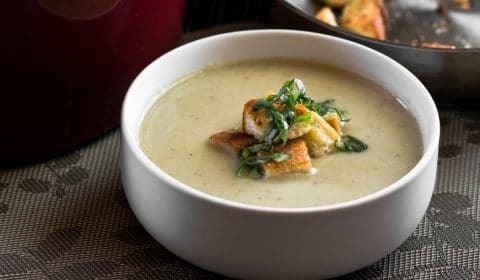 Now I get that this is a very hearty and comforting soup that has tons of flavour. And it’s the type of dish where it doesn’t matter too much if every single ingredient isn’t cooked to perfection. However, wouldn’t the minestrone soup be better if every ingredient in that soup was cooked as close to perfect as possible? So, the way I prepared my minestrone was by cooking the pasta to al dente in the stock first, then straining the pasta making sure I the stock wasn’t discarded. I like doing this because this allows the stock to reduce a bit which intensifies the flavour. From there, you can add your tomato, your aromatics and cook your vegetables etc. Then, once the vegetables are cooked through nicely, you can simply just add your pasta at the end. There is no further cooking required. Feel free to read through my recipe and share your thoughts. And correct me if you feel that I am wrong about how I structured my Minestrone. As you can see in the pic below, the vegetables, beans pasta etc. outweighs the liquid in this soup. 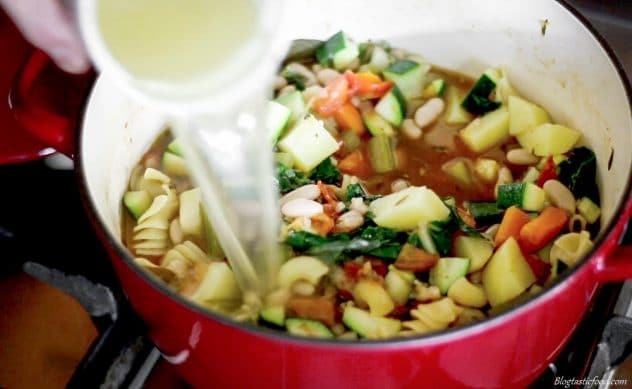 Minestrone should be chunky and packed with solid ingredients. It should be almost like a stew but not quite. So if you’re thinking to yourself “is my soup overfilled?”, the answer is probably no, but if you feel like you could add a of bit extra stock go for it. The great thing about soup is it always tastes better the next day. Although be careful with this soup. Leaving it overnight in the fridge may cause the soup to thicken a bit too much. And then it may turn in to a stew or casserole. So this may be a good time to thin it out with some extra stock if you really want to. Either way, you’ll still have some great tasting leftovers. Minestrone should last about 3-4 days in the fridge. Thank you so much for reading through this post, I hope you got something out of it. If you like this recipe, I ask that you give it a star rating in the recipe box below. And if you want to subscribe to this blog, go ahead and do so. 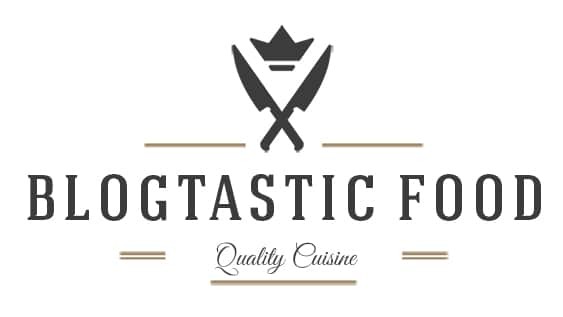 You will receive a recipe post every week through E-mail, and you’ll get a free E-book featuring 10 more recipes. Have an awesome day! Much love to you! 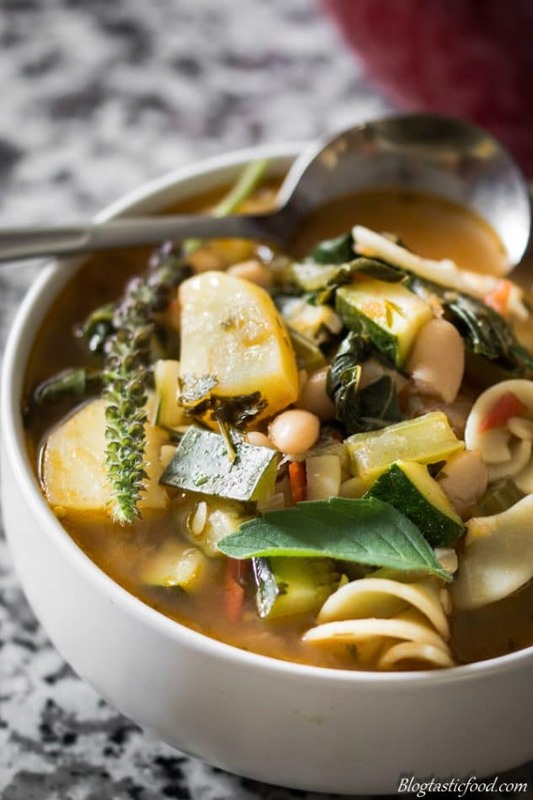 This minestrone soup is the perfect recipe to celebrate your veggies! It's comforting, warming, super hearty and delicious. Put your stock in a pot and bring to the boil. Add your pasta and cook to packet instructions until al dente. We do not want to discard the stock, so put a sieve over a large bowl, then strain the pasta, making sure you get all of that stock in the bowl. Set aside. Get the pot back on the stove over medium heat. Add your oil, then add your onions, garlic, carrots, celery, thyme, bay leaves, parsley stalks and fry for a couple of minutes. Next add your stock back to the pot, bring to the boil, then lower the heat and simmer those ingredients for about 15-20 minutes. At this point, add your potatoes, tomatoes and tomato paste. Once again, bring the stock back to the boil, then once it is boiling, bring the heat down and simmer for about 7-8 minutes. Add your Swiss chard and your zucchini then simmer the soup for a couple more minutes. Add the pasta and the beans and just warm those ingredients through. And if you feel that it's necessary to add a splash of extra stock, feel free to do so. Pick your basil leaves, roll them up like a cigar then shred them, add them to your minestrone then turn the heat off. Cooking the pasta first, then straining it allows you to cook the vegetables without overcooking them. Boiling the pasta in the stock allows the stock to reduce a little bit so you end up with a really nice flavour. Interesting pasta/vegetable philosophy. A lot of us grew up with over cooked vegetables, I suspect. As to cooking the pasta separately and then adding it at the end to just warm through, there are reasons for that as well. 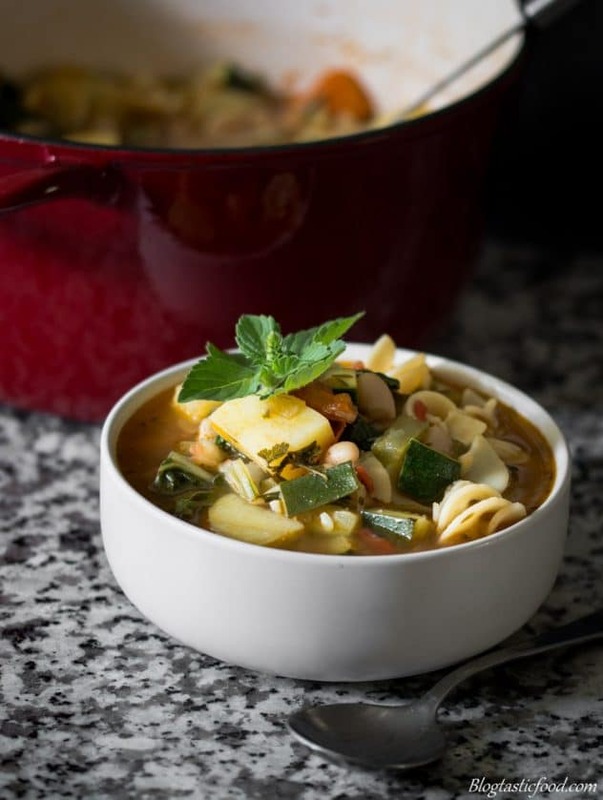 However you assemble it, a good minestrone is a great meal. HI Nick– never say MInestrone Soup with bacon!! Brilliant idea! And– as always your photos are awesome!! I love soups and minestrone brings me good memories. I love the addition of swiss chard. 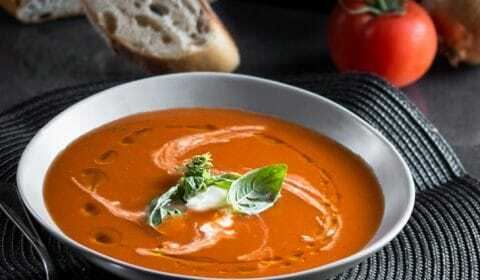 A lovely delicious and healthy soup! Thanks Mary!! Have a wonderful day! !